WhatsApp Tricks Can you Check whom you're taking to the lot? WhatsApp Tricks Can you Check whom you’re taking to the lot? WhatsApp is an instant messaging tool at present time. On daily basis we are doing personal and group chat with different personas. Do you think, who is personal or group chat, where you chat most or share media files. Most of WhatsApp user’s want to know how to check whom you’re taking to the lot? Don’t worry in this guide we have to discuss WhatsApp trick which allows you to check whom you’re taking to the lot on regular basis. WhatsApp is the first choice for all the users for sending instant messages. There are billion of WhatsApp users around the worldwide who spend his lot of vacant time on this app. Most of WhatsApp users don’t know about the hidden tips and tricks. There are many hidden WhatsApp tricks. Many WhatsApp users don’t know about these hidden tricks. You must have to use these important hidden secret WhatsApp tricks at your smartphone. 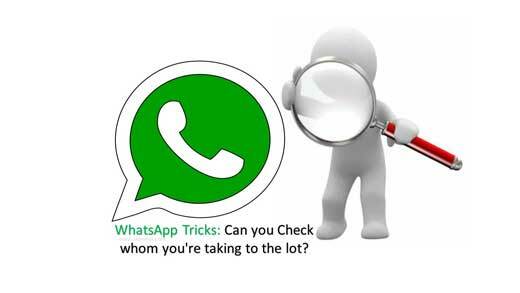 WhatsApp Tricks Steps How Can you Check whom you’re taking to the lot? Step 1: Open your WhatsApp at your Smartphone. In WhatsApp Chat window tap on the three dots which is located at the top right corner. Step 2: Tap on the Settings option > Choose Data and storage usages > Tap on the Storage usage option. Now, you can check list of WhatsApp groups or individual contacts which is ranked as per data usages. WhatsApp recently added a latest feature for his users. WhatsApp allows to know whether the receiver has read your message or not? You can see the exact time your WhatsApp message read or not by the receiver. Blue ticks helps you to check your message read by the receiver or not. Now, if you have updated version of WhatsApp then you can also check exact time at which your WhatsApp message was read. WhatsApp is an instant messaging tool and first choice for all of us. There are many important secret hidden WhatsApp ticks you should try at your smartphones. WhatsApp allows you to delete sent messages, turn on or off blue ticks, edit pictures or text, track your friend location, format text and many more. There are lot of person doing different mistakes on WhatsApp. You must of to know about them and try to avoid common mistakes on WhatsApp. WhatsApp brings latest features in his updated version for Windows, Android and iPhone users. During group chat when you send any message it will be delivered to all the group members. If you want to send WhatsApp message only few person during group chat then then you have to use tagging feature on WhatsApp. WhatsApp updated version allows you to tag peoples during WhatsApp group chat.